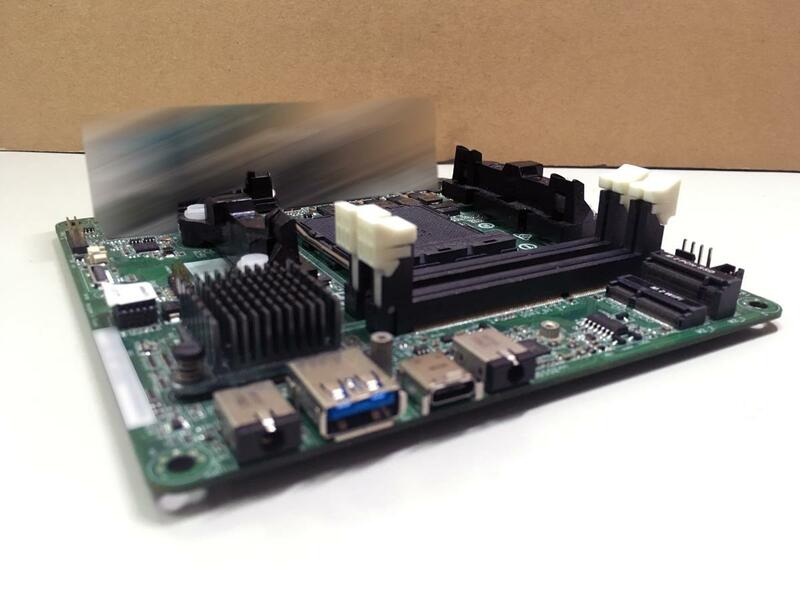 We like small computers, so we are delighted with the Mini-STX format which represents boards that are even smaller than Mini-ITX but still with “full-fledged“ processors. Mini-STX does not allow the use of external graphics cards, making AMD processors with their relatively strong iGPU an interesting choice. Mini-STX boards have not been produced for them yet, but it looks like ASRock is about to change that. Although ASRock has not officially announced anything, the company might be already planning this format of boards for AMD processors. At Small Form Factor Forum on Friday, one of the employees posted that they are analyzing possibilities of STX boards for AM4 platform, but these attempts are probably just initial preparations. In the photos, this person from ASRock showed the chassis from the Mini-STX barebone DeskMini, the Ryzen 3 2200G boxed cooler (which is too high to fit inside), but mainly a prototype of a Mini-STX board that is obviously for AMD processors. You can see a black socket with holes for pins, not the LGA type socket used by Intel. 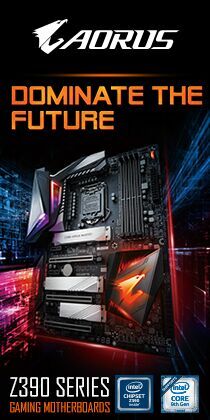 The company claims that they merely observed possibilities of designing AM4 boards during the Chinese New Year, but this photo may indicate that ASRock probably is seriously interested in such a product. The prototype in the photo is not yet for Ryzens (AM4), or at least it does not look like it. 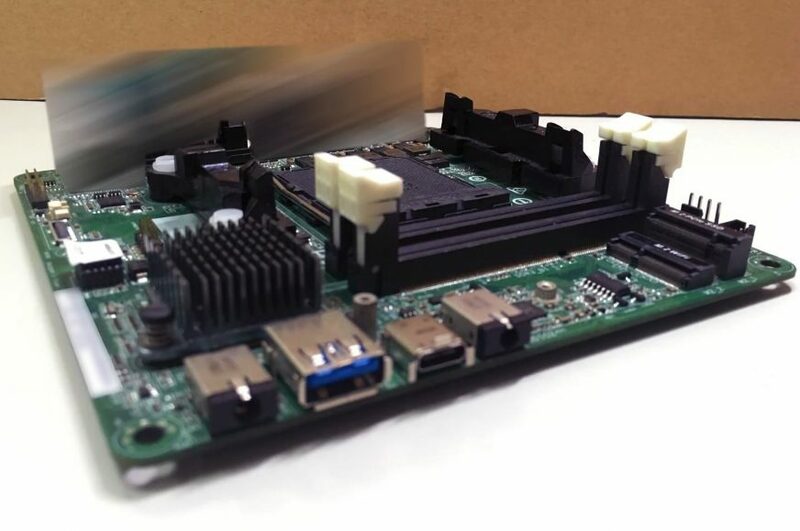 The ASRock employee revealed in his post that the company has previously developed a Mini-STX board with the FM2+ socket for older 28nm APU Kaveri and Godavari, which is probably the one in the picture. Cooler holders match those for the FM2+ socket, and SO-DIMM slots seem to be designed for DDR3 memory. The very existence of a Mini-STX board for FM2+ is something new, although ASRock does not sell it and does not mention it on their web. This particular case is probably closed, but the new project of AM4 boards might be more fortunate. The reason why the FM2+ Mini-STX board did not make it could be problems with coolers. According to the ASRock employee, the AM4 processor sockets need a lot of free space around, which can be a critical obstacle on a 14.0 x 14.7 cm Mini-STX PCB. 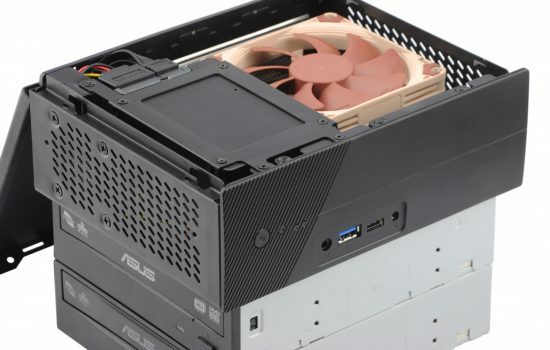 While Intel uses 75 × 75mm mounting holes, older AMD sockets have a rectangular 95 x 47mm holes pattern, and box coolers need some extra space on the sides. According to ASRock’s employee, the board was eventually compatible only with tower coolers, which is not suitable for mini PCs. Hopefully, the change of mounting holes for the AM4 socket will help (now the size is 90 × 54 mm), or that you will be able to get everything you need on the board thanks to X300/A300 chipsets. They should have less consumption, and the size just for compact PCs. However, these chipsets have not yet been used by any board or PC manufacturer. So, it is not clear yet whether Mini-STX boards for Ryzens will be available for sale anytime soon. Unfortunately, we cannot even say that the ASRock staff was told to give this idea a closer look by the management. The post could have been created just for the sake of curiosity, without any specific plans. But the existence of a prototype STX board for older APUs could mean that ASRock is willing to develop something similar. 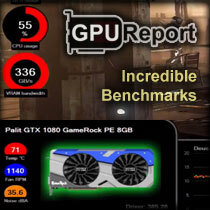 In addition, Ryzen is definitely much more successful than older APUs, which can be just the reason for ASRock to come up with the mentioned product. Back to: Mini-STX and AMD? In my opinion, This format so lends itself to BGA’s. Consider the QC5000M and the Intel j3455 equivalent. and probably covers the majority of Use Cases. Basically, without a Ryzen version, the Mini-STX form factor holds zero interest for me. You can get a CPU+RAM+SSD in any number of smaller formats – if that is enough for you. Mini-STX is not as small as would be possible, so it had better feature some purpose besides being slightly smaller than Mini-ITX while being quite a bit more limited at the same time – namely, too limited to install a separate GPU or any other expansion card. It would be perfect for a sub $500 gaming box you can strap to the back of a monitor or TV, that can play WoW, SWTOR and other games that don’t quite require Nvidia to play.